A gorgeous-looking, unobtrusive heating solution which can be mounted on a wall or used as a stand-alone, movable comfort provider. It has a pretty large heating panel but is very shallow in depth. Functionally, I find that it works extremely well. It is silent, fast, programmable, there is no odour and it's cheaper to run than my older electric heaters. It also has an overheat safety switch-off feature. Our stone house can be difficult to heat comfortably in the winter, and also in the shoulder seasons. We have gas-fired central heating but it is now quite expensive to run. Often it makes no sense to have it on when we only want to heat part of the house. So we have accumulated a collection of portable heating units using different technologies. 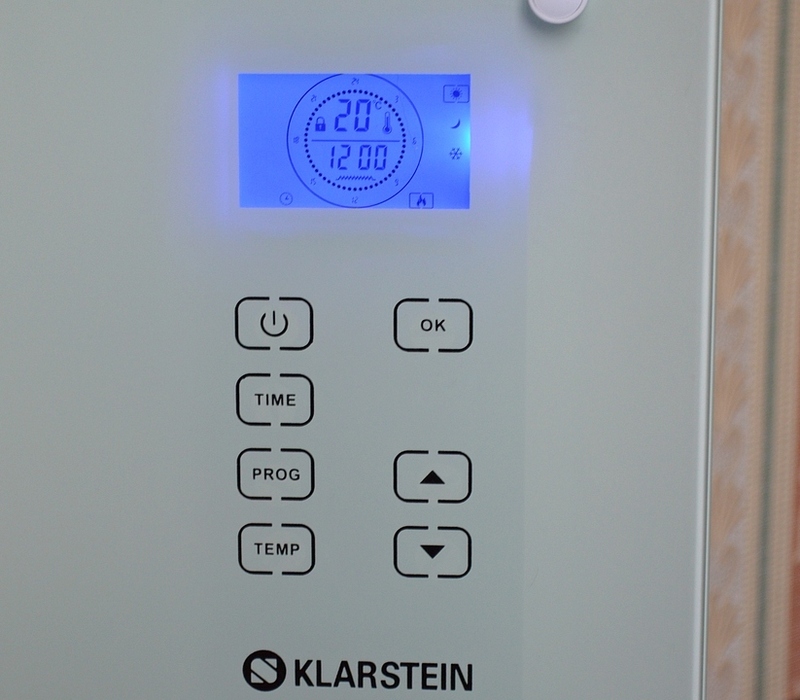 This Klarstein heating panel is by far the best of the lot. When I was new to it, I found the child lock feature a little annoying. If you pause for more than 10 seconds while programming, it locks up the panel. However, now that I have become familiar with the programming, it's really not an issue. 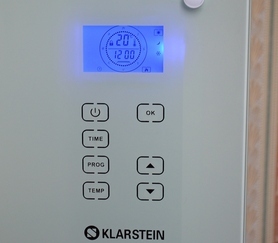 We use it exclusively in Free Heating mode because we have the panel mounted on its feet so it is movable, but the weekly programming is really convenient if you prefer that option. If necessary, disable Child Lock by pressing OK and then ▼. The heat generated spreads well within the area and heats more than just one room if we leave the doors open. We use it primarily in the room where we spend the evening, and in the bedroom at night before going to sleep. The white is really a pale aqua colour, and it happens to match our bedroom décor to perfection, but there is an identical unit in black which would also look sensational in a different setting. Compared to our fixed radiators, it is also really easy to clean: a touch of vacuum round the feet, back and sides and a quick wipe with a damp cloth and then a dry one, whenever necessary, which is not often. Because it's so efficient and fast, it has proven to be quite cost-effective and certainly much cheaper to use than our electric fan heaters. In short, I am delighted with it. Like so many people, I don't enjoy ironing. However, today I spent an hour doing it, and it was almost fun. This steam-generating ironing station is a kick to use. The tank takes a full litre of water, which lasts through ½ hour of non-stop ironing. The iron itself is very light, quite large and easy to manoeuvre into tight spots. The heat settings for the ironing plate span a very useful range from moderate for delicate fabrics to very hot for linen and stiff materials. The steam can be adjusted from no steam (dry ironing) to full steam for thick fabrics and vertical use. There is a light indicator on the iron to confirm that the correct temperature has been achieved, and another one on the main unit which gives a useful indication of when the water has dropped below steam-making level so that one does not end up with water spots all over the place. When the tank needs refilling, all you have to do is turn off the main base (the manual also recommends unplugging), pull out the reservoir and top it up, basically on the fly. Steam release is regulated by a big push-button on the top of the iron. Press down for steam and release for dry ironing. This appliance can also be used vertically to remove creases from hanging garments, fabrics too delicate to press, and fixed items such as drapes and curtains. This function works beautifully with the steam set at full and the ironing plate at max heat. The instruction manual is in clear and detailed English. So today I faced a basket full of freshly-washed clothes. I was amazed at how much time it saved me. It probably took half the time that I would normally have to spend and because the iron is quite large, big items like sheets and pillowcases get done much more quickly than with my old iron. Also the hot setting really is hot, and the full setting produces an impressive amount of steam. I received this beautiful appliance for testing and review purposes a couple of weeks ago, so the only thing I cannot comment on is durability, but it has a look of tough quality, the metal plate of the iron is very smooth and glides beautifully and I was impressed by the thickness of the cables, both the power wire and the steam conducing one. You can see this iron in action in my video.